Sometimes a craft is born from necessity. In the case of this craft, my sister and I had finished making The World’s Best Chocolate Chip Cookies and successfully dirtied every utensil and bowl in the house, when we realized we were all out of dishwasher tablets. 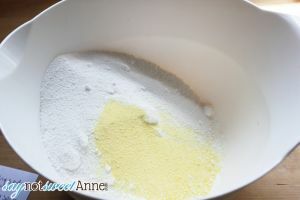 Combine all of your dry ingredients in a large mixing bowl. Gently pour in water. It will fizz. Wait a minute so that most of the fizzing has died down. 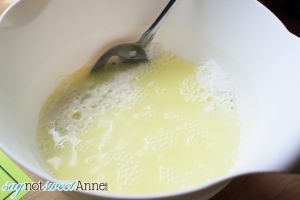 Stir the mixture until it is evenly one texture. To me it felt like wet sand. Use a melon baller or a teaspoon to measure out your pellets. Keep the shape and size of your dishwasher’s receptacle in mind. These large melon balls are perfect for mine. Let them dry for 24-48 hours. Strangely, as they dry the lemon smell goes away- but once they are wet in the dishwasher it comes back! Store in a gallon zip-top bag or another clean, dry place. That’s it! We’ve been using ours exclusively for a week or so now, and I cannot believe how well it compares to the $8 a bag we were spending. 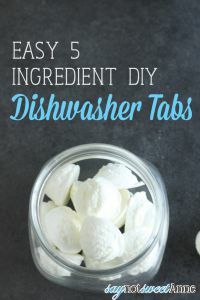 What if you leave the water out and just use the dry ingredients mix on the dishwasher receptacle? Do you think it would work? I made these today! They came out somewhat runny, but I don’t care as long as they work lol! I can’t wait to use them!! Don’t worry they will firm up! How many tablets do they make ? On average ? That would really depend on how big you make them. I’m sorry I can’t give you a number. I aim for about 2 tsp each and got about 30.
is the lemonade mix necessary? What does it do? 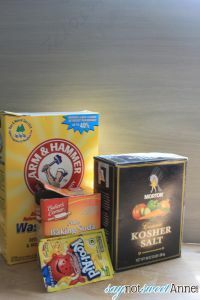 The lemonade mix adds a nice deodorant as well as some minor acidity to the mix. It would probably be fine if you left it out. The lemonade has citric acid in it which helps break down hard water. It will also help keep your dishwasher clean and fresh smelling. I just made these. What a great idea. I didn’t have a scoop small enough that I liked, so I am using a mini cake pop silicone pan to mold them. We’ll see how it goes. Hopefully no one will sneak a bite before they are done. 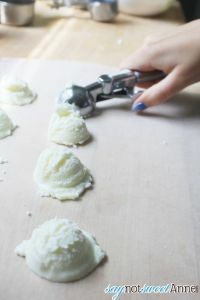 How did using the cake pop mold work? I was wondering if using something like ice cube trays would work too or if they would stick. I’m not sure about Tracie, but I did try to mold mine in a plastic chocolate mold first. That did not work at all. They stuck so awful I had to dissolve them in hot water, AFTER I cracked one of the molds trying to get them out. If you don’t have a melon baller, I would recommend using a spoon to make mounds. Thanks! I was just wondering for the sake of having them in something while they dry if you have to move them. HELP! I made these but they left a white film all over my dishes. What do I do to fix this!? Hey Niki – weird! Did you follow the recipe exactly? 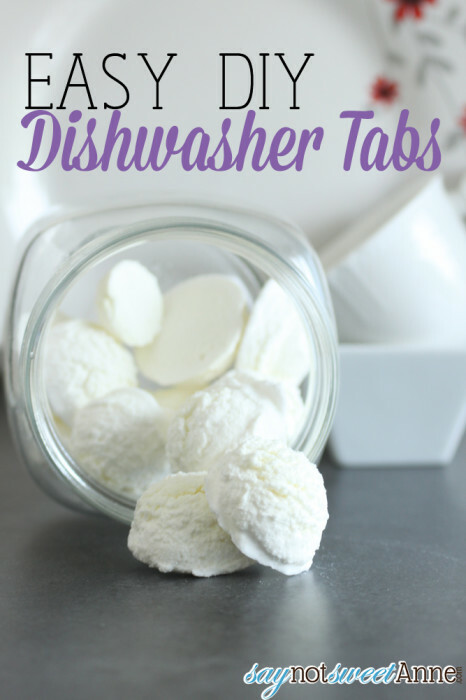 Run your dishes once more with just white vinegar in the washer. That should dissolve any left over deposits from the washing soda. I used a 1 tablespoon scoop and the mounds are too large for my dispenser! I’ll still use them, without the dispenser, but next time I think I’ll try just using the powder. I just made these, and I waited a minute or two for the fizzing to stop and it was as hard as a brick. I had to chop at it and add more water. 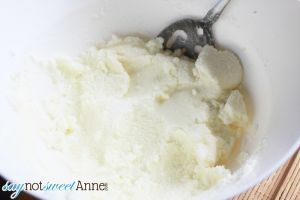 I have some “chuncks” I will use then just scoop the rest. Next time I will probably leave out the water and just scoop all of it. It totally works as just a powder too. I used this twice since I made them, they have a NASTY film on them. The first time I thought it was because hubby used two of them, but the same thing happened with just one. Any suggestions? I am ready to go buy a box. Amazing tabs! Very nice step-by-step instructions, thanks for you pictures!